How do I undo emoticons in a Live Mail message? 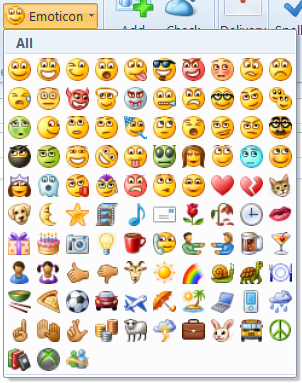 Windows Live Mail makes it easy to include emoticons in email messages. They can all be generated with one or more characters, usually enclosed in parentheses. But what if you want something like “select your file(s)” to appear that way and not have an emoticon replace the “(s)” or similar text? Type your text, when the emoticon appears just press the backspace key, or click the “undo” icon, or press Ctrl+Z. The original text you want will replace the emoticon and you can continue typing. 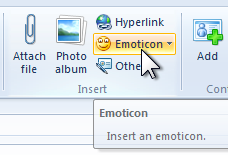 If you want the emoticon, click Emoticon in the Insert group up in the Ribbon. The drop-down menu offers a wide selection. Just click the one you wish to insert. 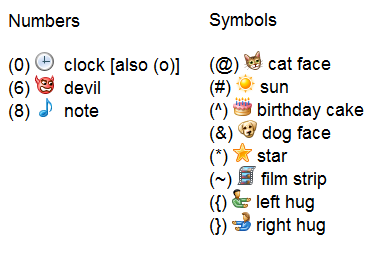 Here is a partial list of “single character in parentheses” emoticons. Note that this list includes a few symbols that are not emoticons. These are images to avoid confusing your browser. This entry was posted in Windows 7, Windows Live Mail and tagged email, emoticons, Windows Live Mail by Ludwig. Bookmark the permalink.